Christmas is by far the most important holiday of the year in Italy—the festivities lasting from December 24th through January 6th. Family gatherings are the most important part of Natale. This is the time of year when families reunite from whatever corners of the world they may have scattered and, it is around the table or a tavola, that Italian families come together. As we all know, these holidays can sometimes be anything but serene; nonetheless, Natale allows parents and children, siblings and in-laws, friends and sweethearts—and sometimes a grandfather (nonno) or grandmother (nonna), or an old beloved aunt (zia)—the opportunity to see one another after long separations, spending significant time together over festive food and drink. Natale is one of the few occasions of the year in which family traditions are revered above all else; skills, memories and team work all come together to create very elaborate banquets and fabulous dishes. What will be eaten during the festa is a kind of ritual; very often each single course is prepared in the same way it has been for generations. Days are spent in the kitchen—everyone pitching in—with lots of long, languorous hours between meals, spent relaxing and digesting and chatting—the long-awaited family conversations punctuated by the sound of walnuts, almonds and hazelnuts being cracked open and the shells tossed into the fireplace. 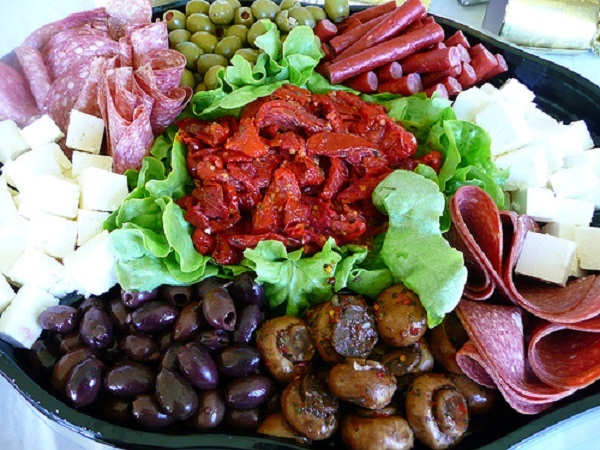 The first course is often preceded by a classic antipasto with slices of cured meat, garnished with olives, cheese and, of course, hearty bread. Drain tomatoes, reserve juice. Finely chop the tomatoes and set aside. In a large saucepan, cook carrot and onion in olive oil until tender. Add garlic; cook 1 minute. Add reserved juice, tomatoes, tomato paste, red wine, parsley, basil, oregano, salt and pepper. Simmer 1 hour, stirring occasionally. 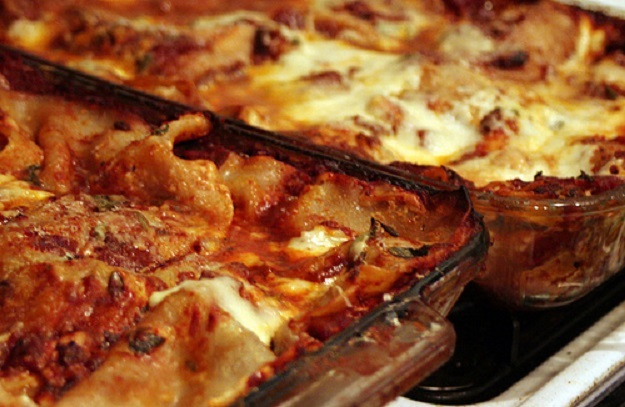 In a medium bowl, combine tomato sauce and cooked beef or sausage. 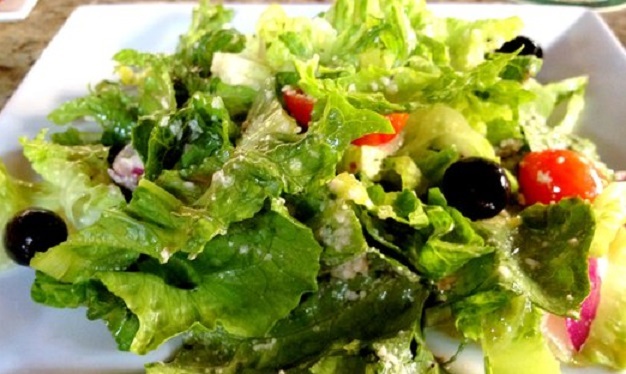 In a separate medium bowl, combine Ricotta cheese, 3/4 cup Parmesan cheese and parsley. Pour 3/4 cup tomato mixture in the bottom of 13 x 9-inch baking pan. Layer one-third of the noodles, half the Ricotta mixture, one-third of the remaining tomato sauce and 1 cup Mozzarella cheese in the baking pan. Repeat layers. Top with remaining noodles, tomato sauce and 1 cup Mozzarella and 3/4 cup Parmesan cheese. Cover with foil and bake at 350°F for 50 minutes; uncover and bake 15 minutes more. Let stand 10 minutes before serving. Season chicken with 1/2 each of the salt and pepper; set aside. Finely chop 4 of the sage leaves; set aside. 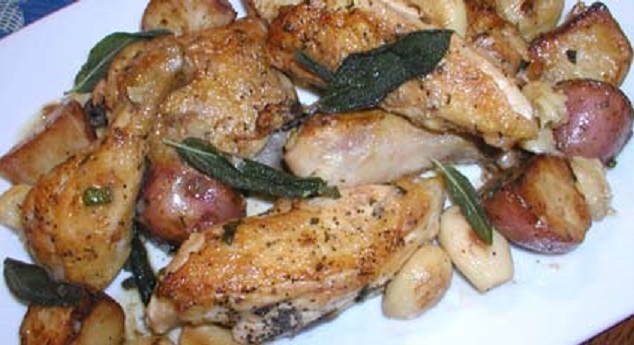 In a large ovenproof skillet, heat oil over medium-high heat; saute garlic cloves and remaining whole sage leaves until garlic is lightly browned, 1 minute. With a slotted spoon, set sage aside for garnish. Remove garlic and set aside. Brown chicken, in batches, 5 to 6 minutes. Transfer to a plate. Add potatoes to the pan; sauté until browned, about 7 minutes. Pour off fat. Return chicken and any accumulated juices to the pan. Add wine, remaining salt and pepper, garlic cloves and chopped sage; bring to boil. Place pan in the oven preheated to in 425°F (220°C) and roast, basting 2 or 3 times, until the sauce is thickened and juices run clear when chicken is pierced, about 30 minutes. Serve garnished with reserved fried sage leaves. Combine the ingredients for the dough, knead it well and let rest for at least an hour, covered. It does take a while for the dough to absorb the eggs. Pluck off a piece, roll it out under your fingers to form a snake about as thin as your pinkie and cut the dough into quarter-inch long pieces. Fry the pieces a few at a time in hot oil until brown and drain them on absorbent paper. Repeat with remaining dough. In another pot, preferably round-bottomed, put the honey, sugar and water in it. Boil the mixture until the foam dies down and it begins to turn yellow. At this point reduce the heat as much as possible and add the struffoli. Stir to distribute everything evenly through the honey and turn the mixture out onto a plate. Using your fingers shape the mixture into a wreath with a hole in the middle or in a dome shape, dipping your hands frequently into cold water so you don’t burn yourself. Sprinkle with colored sprinkles and arrange the cherry halves evenly. 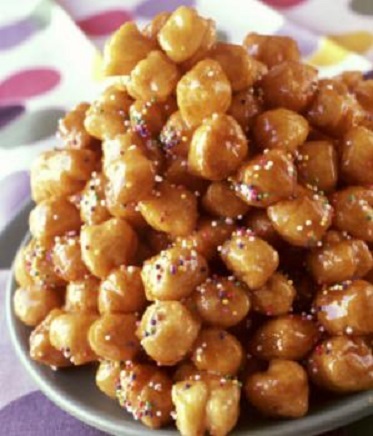 Struffoli will keep a week or more, if covered, and the dessert improves with age. 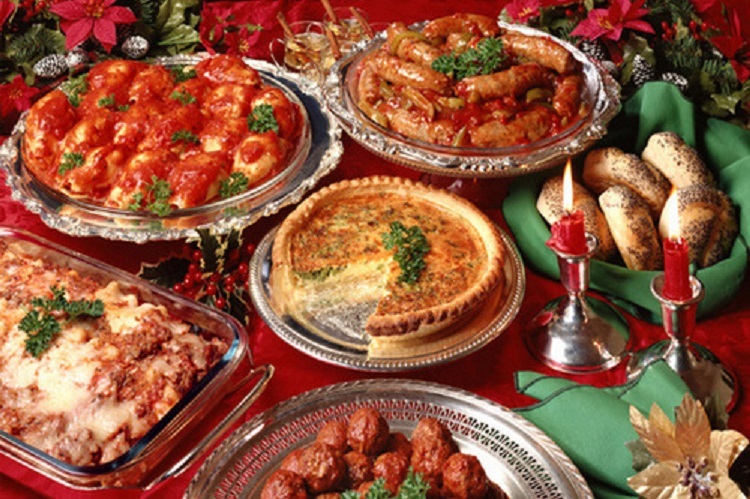 Wonderful Italian Christmas menu ideas from Jovina Cooks Italian. My mouth waters just looking at the pictures. Happy Holidays Everyone. Thank you so much Heidi. Have a wonderful holiday. If all of this is on your table, I’d love to be at your place for Christmas dinner. Happy festive season and good blogging in 2015! Have a wonderful holiday with your family. What a beautiful spread! Merry Christmas to you and your family! Great stuff Jovina, save me a plate I’m coming over lol. Anytime, Have a wonderful holiday with your family. Everything looks delicious. There is a problem though — you forgot to give me the time and the address 😦 I’m all packed!! Buon Natale e Felice Anno Nuovo!! Sorry about that. Have a wonderful holiday. This is making me hungry! Merry Christmas! Looks like a perfect combination. I am going to consider this for next year. Thank you so much for your gracious comment.